Ven. 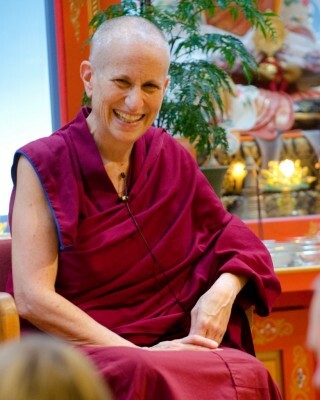 Thubten Chodron is a celebrated American Buddhist teacher, scholar, author, and leader who has published many popular books explaining the Dharma, including a 2013 work co-authored with His Holiness the Dalai Lama called Buddhism: One Teacher, Many Traditions. She has continued to work with His Holiness, and the most recent product of their collaboration is Approaching the Buddhist Path, released in August 2017 by Wisdom Publications. This book is the first in a new series—The Library of Wisdom and Compassion—that will constitute the main English-language Dharma teachings of His Holiness, intended to explain the path to enlightenment in a way suited to modern-educated people. Former Mandala associate editor Donna Lynn Brown spoke with Ven. Chodron in June 2017 about the new series and the intentions of His Holiness. Mandala: Please tell us about the new book, Approaching the Buddhist Path. Ven. Thubten Chodron: This is part of a series I am now doing called The Library of Wisdom and Compassion, in collaboration with His Holiness. It has a very specific purpose. Our tradition has many lamrim books as well as translations of very difficult Tibetan and Sanskrit philosophical works, but we don’t have anything that makes the connection between them. Yet His Holiness wants us to learn the philosophy that is embedded in lamrim. So we need something to bridge the gap. That’s what this series will do. It explains, in easy-to-understand English, philosophical topics and how they fit with the lamrim. Without such a bridge, people can miss out on our very rich philosophical tradition because they find it too difficult. This series also tries to clarify a lot of Dharma questions that Westerners have that Tibetans don’t usually ask. I’ve had several interviews with His Holiness, and he answered these questions in his own unique way. Another challenge non-Tibetans have with the lamrim is that—as His Holiness explains—it was written for people who are already Buddhists. Lamrim texts don’t talk about why rebirth makes sense; they assume you already believe this. And the guru is Buddha? People say, “I just came to learn to meditate! What’s that all about?” So in this new series we are re-ordering some topics and approaching some of them in a different way. Regarding, for example, how to relate to a spiritual mentor, His Holiness explains that in depth for a modern audience. If people start out reading Pabongka Rinpoche’s Liberation in the Palm of Your Hand, they don’t know that he was teaching Tibetans who were about to take highest yoga tantra initiations. That’s not who walks into Dharma centers! People need preparatory material. In the West, what does His Holiness usually teach? Love, compassion, and secular ethics for everyone. For Westerners who are interested in the Buddha’s teachings, he starts out with the Buddhist worldview: the nature of the mind, the two truths—conventional and ultimate—the four noble truths, and the possibility of being free from the afflictions. Understanding these topics, people will then understand something about the basis, path, and result and will see how the lamrim meditations fit in. This project takes on the task of explaining the whole path, in some depth, to people who have a modern education. This series is not limited to Westerners. His Holiness says it’s also for young Tibetans as well as Chinese, Vietnamese, and other Asian students. His Holiness the Dalai Lama teaching in Florence, Italy, September 2017. Photo by Olivier Adam. I can see that this is a significant project for making the teachings of Buddhism more accessible and better understood. Can you describe what’s in the initial volumes? Approaching the Buddhist Path is the first volume in the series. It lays the groundwork. It talks about the history of Buddhism, the Buddhist worldview, Buddhist canons and important texts, emotions, Buddhism and science, compassion, tools for the path, helping others, and so on. And it contains His Holiness’s reflections on his approach to life and personal practice as a kind of inspiration. The second volume, The Foundation of Buddhist Practice, is now also with Wisdom Publications. It starts out with the four seals, the criteria that make a teaching “Buddhist.” It goes on to talk about gaining non-deceptive knowledge—how we know evident and obscure phenomena. In this way we’ll understand what is knowable through our senses and what initially requires reasoning to understand. In Buddhism, we don’t rely blindly on scripture, we test things out. The second volume also discusses how we go from having a wrong view to a right view. Then it talks about the different kinds of phenomena. There are chapters on the qualities of different types of spiritual mentors, how to rely on our spiritual mentors, and how to become a qualified disciple. People need to learn about this when they start out in Buddhism. We present how to structure a meditation session, and then we talk about precious human life, death and impermanence, and the lower realms, but it’s all from His Holiness’s perspective. He doesn’t describe the eight cold hells, and so on. He talks about how we are to think about these different realms. He’s such an amazing teacher because he can really tune in to his audience. We talk about the death meditation, for example, and how that helps us overcome attachment to the happiness of this life, how it helps us set priorities and be aware of what is meaningful in our lives. Really practical material. Then we come back to talking about the nature of mind and rebirth, and how we can establish rebirth using reasoning. Then there are three big chapters about karma. Standard lamrim texts present refuge before karma, but Westerners aren’t ready to take refuge yet. To hear about the qualities of the Buddha at that point is too much for them. What people really want to know about after this introductory material is karma. What is it? How does it work? There is a lot about karma here, including material from the abhidharma, which enlarges our understanding of karma—individual and collective karma, gloomy and bright karma, and so forth. And then volume two talks about why liberation is possible and what buddha nature is. Those topics naturally follow because, having heard about karma, we want to know: can we be liberated from polluted karma? The material on buddha nature is taken from the Uttaratantra Shastra and from a text by the Seventh Dalai Lama. His Holiness went through the latter text in one of our interviews, relating buddha nature to the three turnings of the Dharma wheel and showing how the full explanation of buddha nature is found in highest yoga tantra. So that is the second volume. The third talks about whether there is a self, the four noble truths, and it especially goes into depth about the first and second noble truths. So it explains what “duhkha” is. We use the Sanskrit word “duhkha” instead of the usual term “suffering” because “suffering” gives completely the wrong idea. Duhkha is more like “unsatisfactory circumstances.” What are those and what causes them? What is our situation here in samsara? If people don’t understand this, they’ll never aspire to gain liberation. Then we go into the different kinds of afflictions and how they work. This is followed by the twelve links—how we enter samsara—and the reversal of the twelve links—how we get out of samsara. Then there is discussion on what nirvana is. What are we aiming for? Is nirvana a state of mind? Is it emptiness? Garden at Kachoe Dechen Ling, California, US, November 2014. Photo by Chris Majors. The fourth volume begins with refuge. Having previously thought about the faults of samsara and benefits of nirvana, people now seek guidance on how to attain liberation and awakening. The qualities of the Three Jewels will now make more sense. The three higher trainings follow; they are the path to our spiritual goals. Here we present a lot of material on the four establishments of mindfulness, which is a very rich practice that people in the Tibetan tradition often do not do, even though they study it. I think it is a very helpful practice, especially before taking tantric initiations. In tantra, we imagine ourselves dissolving into emptiness and our wisdom appearing as the body of a deity. If we have not done the four establishments of mindfulness, we do not understand our current body and mind. What are their causes? How do they operate? When we understand that better, dissolving into emptiness and appearing in the form of a deity in tantra makes more sense. The fourth volume also contains an extensive explanation on how to cultivate concentration. The subsequent volumes will cover bodhichitta, the perfections, emptiness, tantra, and so forth. When His Holiness asked me to do this, he said, “We don’t need to rewrite the lamrim! This has to be unique.” He wanted material from other Buddhist traditions included, and this has enriched the volumes immensely. The teachings on the four establishments of mindfulness and on concentration will include material from the Pali tradition, not just the Sanskrit tradition. This gives us a broader perspective on the Buddha’s teachings. The various Buddhist traditions are not unrelated; they have a lot in common. We can learn from each other. Some of the bodhisattva vows talk about respecting other traditions and teachings. We are trying to promote not only mutual respect, but also to show the validity of other Buddhist traditions and the ways that learning about them can really help our own practice. It sounds like this series would be helpful in both Dharma centers and academic environments, and for Buddhist schools like FPMT’s Maitripa College as well. I think so. The idea is that the series will help people establish a solid foundation in the Buddhist worldview and Dharma practice in a way that combines the richness of the philosophical texts and the practicality of the lamrim. Although the books will help beginners, they are also for people who need a bridge between the relatively simple explanations in the short lamrim texts and the profundity of the classics composed by the Indian sages. They will be a resource for anyone who wants to study Buddhist philosophy, even at a more advanced level. Since this series will be His Holiness’s major English-language teachings, I hope the books will be used in Dharma centers as well as schools and universities. The series consists of His Holiness’s teachings. My job is to “translate from English into English,” to express more complex points in a clear and understandable way. This is not “Dharma lite”! The teachings are grounded in the genuine, reliable teachings of the Nalanda tradition, supplemented with teachings from other Buddhist traditions where that is helpful. Do you think Asian Buddhists, including monastics, could benefit too, if the books were translated? I am told that young monastics in the Tibetan tradition, for example, often go straight into philosophical study without much explanation of basic Buddhism. Yes, I think the books will be useful in Asian contexts, for both lay people and monastics. There is a need. His Holiness wants our earlier book, Buddhism: One Teacher, Many Traditions, to be translated into Tibetan and into as many Asian languages as possible. I anticipate that he will want this series to be widely translated as well. He mentioned young Tibetans who grow up speaking English or German as one group we need to reach out to. With their modern education, whether in India or the West, they ask the same kinds of questions Westerners ask about rebirth and so on. The contemporary style of presenting the material is not just for Westerners, it’s for anyone with a modern education or outlook. In the monasteries young people memorize the philosophical texts but they don’t initially understand the material. It would be helpful if they read this series, especially the volumes that discuss the Buddhist worldview, Buddhist values, social responsibilities, and working with disturbing emotions—all these topics that His Holiness talks about so beautifully. I also think geshes teaching at Dharma centers would find this series useful to use as a root text that that they can elaborate on. The Prajnaparamita Sutra written in gold at Kachoe Dechen Ling, California, US. Photo by Chris Majors. Can the books be used without teaching or commentary? Yes. People can read and learn on their own. Also, all the books in the series can also be read as individual volumes. Each book covers particular topics, and someone may want to study the topics that they are particularly interested in. It’s very noticeable, as I look at Approaching the Buddhist Path, that you include reasoning as part of Dharma practice, not just meditation. His Holiness always talks about that. Again and again he teaches the importance of reasoning in Dharma practice. That doesn’t mean excessive intellectual conceptualization that is “blah, blah ….” Analysis and reasoning help us to go deep and give us a framework to understand our minds and how they work, and what our life situation is and how to change it. People sometimes say they want to get away from intellectualization and meditate to develop concentration and be peaceful. But then they sit down to concentrate and their minds are all over the place. I am an example of that. At first I had no idea what to do with my mind in meditation and lacking proper instructions, I just daydreamed or got frustrated because I could not stop all the disturbing thoughts. In addition, even if we quiet our minds, which is good, we may lack a framework to identify what is a wholesome or unwholesome mental attitude, or what states are helping us to actualize our heartfelt wish for happiness and which ones interfere with that. Just having a calm mind, even if we can accomplish it, does not end samsaric suffering. We need a comprehensive worldview, an accurate path, and ways to verify for ourselves that this path will work. That’s where learning, reasoning, and analysis come in. They are essential parts of our practice. In addition, we also need to learn how to cultivate certain mental states, such as love and compassion. We can’t will ourselves to have them. We must learn the meditations to open our hearts so that we can accept ourselves and others and at the same time learn how to become kinder and more altruistic human beings. Are there other notable features of The Library of Wisdom and Compassion that you want to tell us about? His Holiness’s way of teaching is unique: he will explain a fairly easy concept and then relate it to emptiness or to the extremely subtle mind. His way of clarifying sticky topics is wonderful. He understands the questions Westerners ask and answers them in a straightforward manner. He doesn’t dance around difficult topics, but addresses them directly. And his sense of humor shines through. Even though I’ve been his student for decades, in working with him on this series, the clarity of his wisdom and depth of his compassion really bowled me over. Ven. Thubten Chodron during a talk at Maitripa College, Portland, Oregon, US, March 2013. Photo by Marc Sakamoto. Ven. Thubten Chodron has practiced the Buddha’s teachings for more than 40 years. A native of Los Angeles, she ordained as a nun in the Tibetan tradition in 1977 and received the full ordination of a bhikshuni in Taiwan in 1986. Ven. Chodron has studied extensively with His Holiness the Dalai Lama, Tsenshab Serkong Rinpoche, Lama Zopa Rinpoche, and Lama Thubten Yeshe among many other Tibetan masters. She teaches Buddhist philosophy and meditation worldwide, including having served as resident teacher at Amitabha Buddhist Centre in Singapore. She has published many books, including Good Karma: How to Create the Causes of Happiness and Avoid the Causes of Suffering; Buddhism: One Teacher, Many Traditions; and most recently, Approaching the Buddhist Path. She is currently the abbess of Sravasti Abbey, a Buddhist monastic community in Newport, Washington, United States, which she founded in 2003. Cover photo: His Holiness the Dalai Lama with Ven. Thubten Chodron and students and community members of Maitripa College, Portland, Oregon, United States, May 2013. Photo by Marc Sakamoto. For more on Approaching the Buddhist Path, visit Wisdom Publications online (www.wisdompubs.org).